Web Industries created the standalone Thermoplastic Composite Development and Qualification Center to process various thermoplastic composite materials that are being used for or considered for use in aerospace applications . Newly expanded format processing facilities that will enable the aerospace industry to take advantage of thermoplastic composite materials have been brought online at Web Industries’ Atlanta Advanced Composites Center of Excellence. The company’s new Thermoplastic Composite Development and Qualification Center is specifically designed, staffed, and equipped for creating processes that format thermoplastic carbon fiber prepreg materials, including advanced materials such as PEEK, PEKK and PPS, for use in various fabrication technologies. 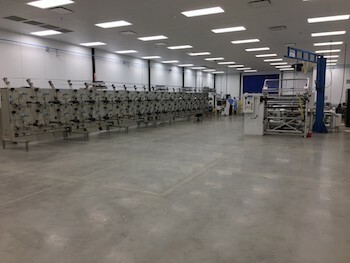 The facility is also employed to qualify the equipment that will process the new thermoplastic composite formats.According to Business Development Manager Jim Powers, the new facility houses slitting equipment capable of cutting materials into tapes as narrow as 1/16 to 1 inch on a traverse wound spooling line. A second slitter/winder precision cuts wide rolls into 1 to 6+ inch strips for planetary wound formats. The space is also equipped with machinery that chops materials into fiber flakes measuring ½-by-½ or 1/16-by-½ inch for use in compression molding, and it will incorporate seaming technology later in the year. All the process equipment can achieve high precision tolerances down to thousands of an inch, contingent on incoming material quality. Thermoplastics have inherent advantages over thermosets in aerospace applications. They can be stronger, have higher heat and chemical resistance, and lighter weight. These and other material advantages can reduce the overall cost of an application. For example, instead of having to fasten aerospace components with adhesives or metallic fasteners, thermoplastics can be assembled by thermal welding or co-consolidation. Powers notes that Web Industries’ extensive experience in formatting thermoset materials for aerospace applications makes the company well suited to pioneer new thermoplastic composites formatting. The engineering goal is to support the requirements of the advanced fabrication techniques of today and the future. Web Industries created the standalone Thermoplastic Composite Development and Qualification Center to process various thermoplastic composite materials that are being used for or considered for use in aerospace applications. It is separated out from Web Industries’ thermoset processes to allow for dedicated solutions and material control. It is climate controlled and closed to maintain cleanliness and reduce potential FOD liability issues.